Incorporating a unique highly sensitive ultra-sonic motion sensor with state of the art electronic drivers, LaMar Lighting has designed an LED lighting system that can detect small movements even around corners. 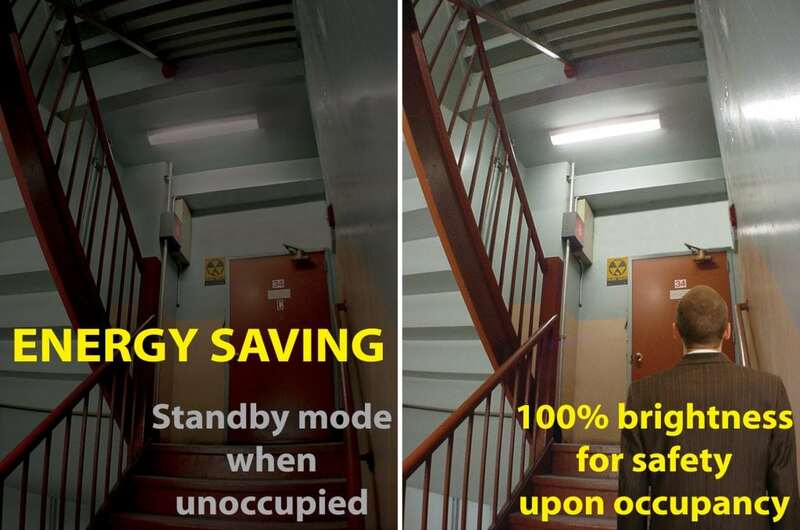 Lighting is kept at low energy saving light levels during un-occupied times, with full light levels only when the spaces are occupied making these fixtures ideal for many different applications as they increase efficiencies, safety and security. Our Occu-Smart® series offers many options for sensor operated lighting systems and is available in a growing number of products to meet many design applications. WHY DO I NEED OCCU-SMART® ? On average, high-rise stairwells are occupied less than 2% of the time. That means 98% of the time you don’t need your lights fully illuminated. Think of the savings you could realize if your lights were on a lower setting 98% of the time. You can with Occu-Smart®. Occu-Smart® is a lighting system designed with automatic bi-level lighting capabilities, so it automatically dims to the standby lighting level when an area is unoccupied – providing greater energy efficiencies while still keeping the area lit. No one is ever left in the dark! Unlike simple motion sensors that merely switch lights on and off, Occu-Smart® luminaires remain at low energy saving light levels during unoccupied times and illuminate to full brightness upon detection of occupancy. Most local codes require a minimum of only 1 foot-candle of light in stairwells. This is not much light. Occu-Smart® helps to provide higher light levels for safe egress while saving energy during unoccupied times. Utilizing state-of-the-art components, and multiple output options, Occu-Smart® now saves more energy than ever before. Some models use as little as 3 watts during unoccupied times and no one is ever left in the dark. Occu-Smart® LED is DLC qualified for many utility rebates. Ask your Lamar representative for more information. Our adjustable light level feature offers standby light levels of 5, 10, 20 or 30% of full light output during un-occupied times. This unique feature also allows for the use of phosphorescent tape in the stairwells allowing you to customize the light level to ensure the tape stays charged. As the leaders in Technology Enhanced Lighting, over 250,000 Occu-Smart® fixtures are in use across the country. Installations include office buildings, apartment complexes, hotels, hospitals, universities, military bases, and government buildings. The most popular application is stairwells in multi story buildings. These are typically lit all the time, yet seldom used. Occu-Smart® is not just for stairwells and our product line includes models for offices, corridors, restrooms, utility rooms and parking garages. HOW MUCH ENERGY IS SAVED? Depending on existing fixtures, Occu-Smart® can save over 85% of energy costs while providing a safer and better lit environment. Our Voyager (VOL) unit uses only 3 watts in standby mode. Easy Installation: Just two wires and a ground! And now, with our VOL Retrofit Kit, you can convert your fluorescent Voyagers into LED in no time! Commissioning is easy too, just set the sensitivity and dwell time to suit your application. Our five minute walk test mode allows for easy adjustment and testing. Occu-Smart® HF fixtures utilize ultra high frequency sensors that can detect motion through plastic diffusers and other low density items. They can be mounted behind a diffuser and allow motion sensor control in areas not well suited for ultra-sonic or infra-red technology. The HF sensors can be incorporated in many decorative luminaires and cannot be seen behind white acrylic diffusers. They are also well suited for interior parking garage luminaires. Many bi-level and on/off options are available.